Papaya (Croazia), Mojito Beach (Rimini), Beach Club (Versilia), Drop Club (Lucca) with Merk & Kremont, Lidò Le Panteraie (Montecatini Terme) with Djs From Mars, Florida Beach Club (Argentario) with Milling Pot, Pappafico with Jack Mazzoni (Pisa), Shire Music Festival (Cremona) with Marnik, Rivaz e Geo From Hell, Opera Music Festival with R3hab e Jay Hardway, Wild (Lucca) with gli Eiffel 65, Countdown (Livorno) with Luca Agnelli, Ilario Alicante e Ralf, Seven Apples (Versilia), Momà (Aosta), Bussola (Versilia), Acquarius (Livorno), Vibe (Roma), Energy (Livorno), Juwel (Bolzano), New Line (Grosseto), B&B (Pisa), Tinì (Cecina), Mood Club (Firenze), Reverse (Pisa), Clover Club (Sondrio), Lumiere (Pisa), Nirvana Soleluna (Pavia), Oltrecafè (Modena), Baronette (Versilia), Sio Cafè (Milano), La Zattera Disco Club (Livorno), Montego Bay (Pisa), Festival della Birra (Lucca), La Playa (Matera), Sea Light (Lipari), La Playa (Livorno), Full Up (Firenze), Il Principe (Arezzo), Hexen (Canazei), Jux Tap (Genova), Nai'r (Pisa), Deep Club (Pavia), Kuku (Lucca), Turmalin (Lipari), Tartana (Grosseto), Boat Party (Pisa), La Rocca (Arona), Holidance Music Festival, Freedom (Pisa), Akua Keta (Pisa), Papillon 78 (Siena), Vibe (Pisa), Centouno Music Club (Siena), Camillo Disco Club (Pavia), Seven Apples (Versilia), Avila (Piacenza), Caramelle Summer Disco (Pavia), Holi Peace Color Festival and much more. 18 April 2016, get up to the podium at Dance Music Awards. 14 April 2017, out their third track "Overtake" on Pyro Records. 15 May 2017, out "Kepler" on Crystalized Records. 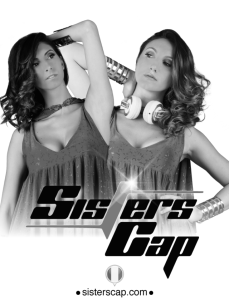 Continuing their passion for radio, currently, they work in the program "Sisters Cap Radio Show" every Friday at 23 on "Radio Incontri" (FM: 88,400 92,800 STREAMING: www.radioincontri.org), hosting weekly DJs with national and international fame, such as: Djs From Mars, Federico Scavo, Stefano Pain, Jack Mazzoni, Nick Corline, Alex Kenji, Madwill & Dejano, Luca Testa, Boostedkids, Rivaz, Maurizio Gubellini and much more.